This gentle, detergent free treatment bar works to deeply cleanse while purifying and minimizing pores. Successfully layering treatments into one bar serves to deeply cleanse and exfoliate, adding polish to skin surface, while acting as a mini-mask treatment to minimize pores. This bar works great for those of us with large pores, oily skin or ruddy complexions. Approximately 1.5 oz (44ml) in a matching Tin. French Green Clay allows this bar to be used as a "mini-mask" for greater results. In this case, wash normally however leave on for a few minutes before rinsing to allow the foam to dry slightly. The clay in the bar will act as a mini-mask, helping to pull loosened debris and cleanse pores. Rinse well. Use with a facial brush or Konjac sponge for added exfoliation. Keep the bar in its tin in the shower for easy use. Do not allow spray to fall directly on bar or for the bar to sit in water. For use on counter top use a draining soap dish or keep in tin, allowing bar to dry before replacing tin top. Some of our customers cut the bar into pieces, only using a piece at a time and storing the used piece on a soap dish while preserving the unused portion in its original tin. 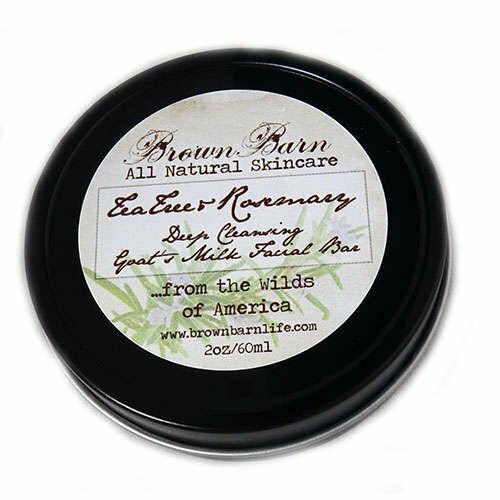 Use this bar morning and night in conjunction with other Brown Barn facial products. Create foam by wetting bar and running between hands. Apply to face. Rinse well. Avoid direct contact with eyes. For deeper cleansing, allow foam to dry for a few minutes before rinsing to activate a deeper cleaning, clay mask effect. Fractionated Caprylic/ Capric Triglyceride (Coconut) Oil, Elaeis Guineensis (Palm) Oil, Carthamus Tinctorius (Safflower) Seed Oil, Glycerin (kosher, of vegetable origin), Goat Milk, Aqua (Purified Water), Sodium Hydroxide (saponifying agent), Sorbitol (moisturizer), Sorbitan Oleate (emulsifier), Hydrolized Soy Protein (conditioner), Illite (French Green Clay), Salix Alba (White Willow) Extract*, Mentha Piperita (Peppermint) Oil, Melaleuca Alternifolia (Tea Tree) Leaf Oil. 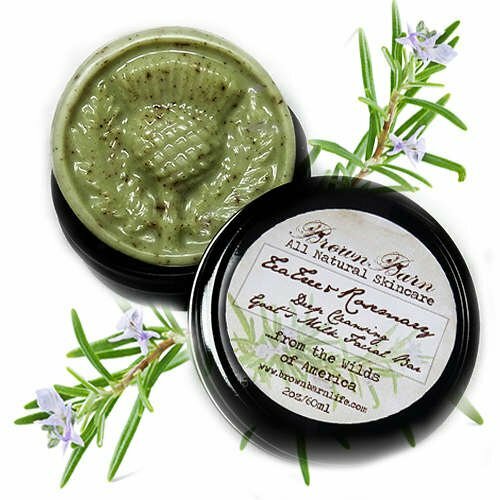 French Green Clay acts as a mini-mask, helping to pull loosened debris and cleanse pores. Layering treatments into one bar serves to deeply cleanse and exfoliate, adding polish to skin surface, while acting as a mini-mask treatment to minimize pores. Allow foam to dry for a few minutes before rinsing to activate a deeper cleaning, clay mask effect. Rich, creamy goat's milk protects skin's natural balance. This bar is non-drying due to the skin compatible pH of Goat's Milk. It is also rich in Vitamin A to repair and maintain healthy skin. 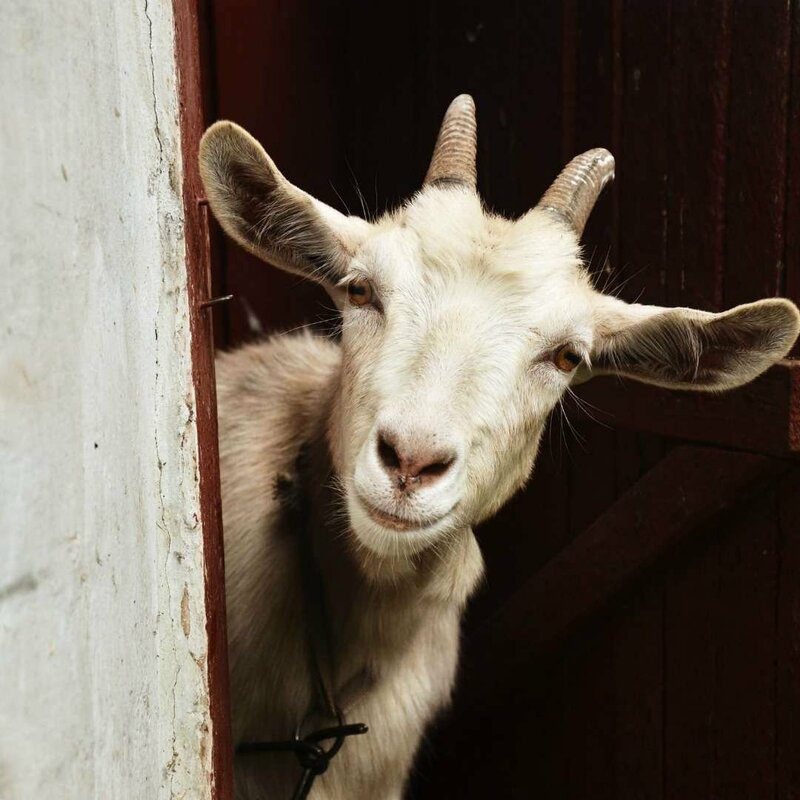 Naturally high in Alpha Hydroxy Acids, Goat's Milk helps exfoliate while cleansing, whisking away pore clogging dead skin cells to reveal a glowing, healthier complexion. Free of harmful sulfates, alcohol, and detergents. A targeted, non-drying essential oil complex works to purify pores and assist in reducing inflammation, blackheads, and large pores. Skin is left feeling clean, soothed, and refreshed. No skin disrupting chemicals, parabens, fragrance, or preservatives. We never test on animals. Made with pure, therapeutic grade essential oils and botanicals. Tea Tree Essential Oil is a gentle essential oil for use in calming angry skin. Strong antibacterial and anti-inflammatory components help to calm angry outbreaks and reduce redness and swelling. 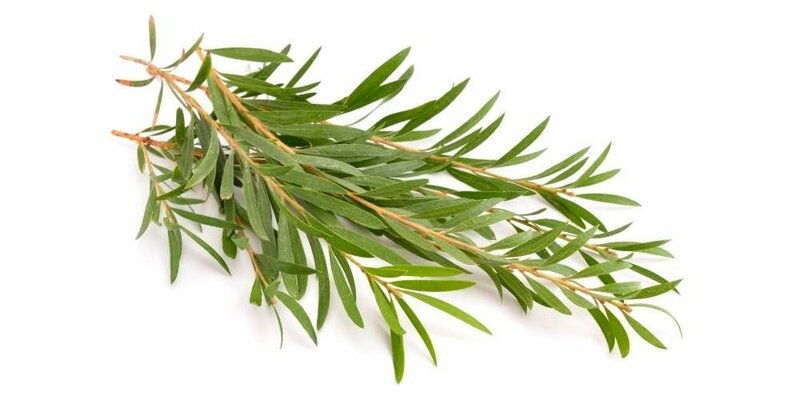 Tea Tree penetrates skin to unblock and disinfect clogged pores. Naturally anti-bacterial and astringent, Rosemary stimulates circulation that stimulates cell renewal to produce a healthy, even glow. Rich in nutrients including iron, calcium vitamins and free radical fighting antioxidants. 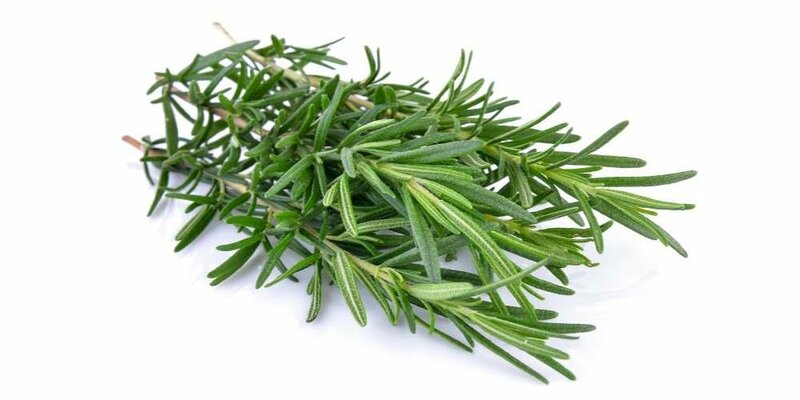 Rosemary is the perfect companion to Tea Tree. White Willow Bark contains Salicylic acid, known to be an all natural and gentle exfoliant and potent tool in the fight against break-outs. 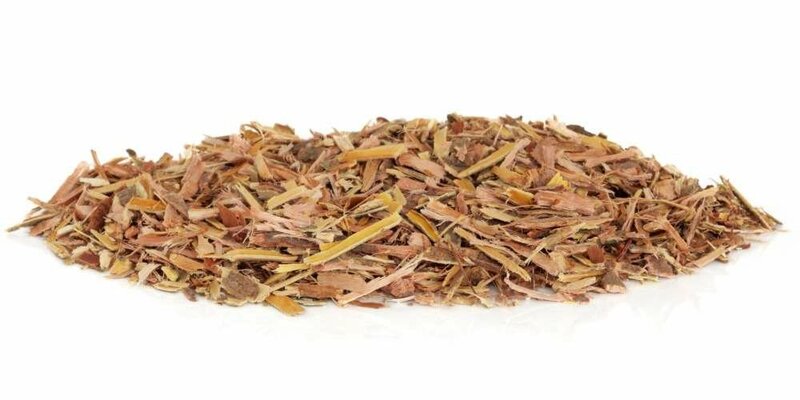 Willow bark contains powerful anti-oxidant flavonoids and tannins to help protect skin from environmental stressors and reduce the appearance of aging. Read our Healthy Glow blog! 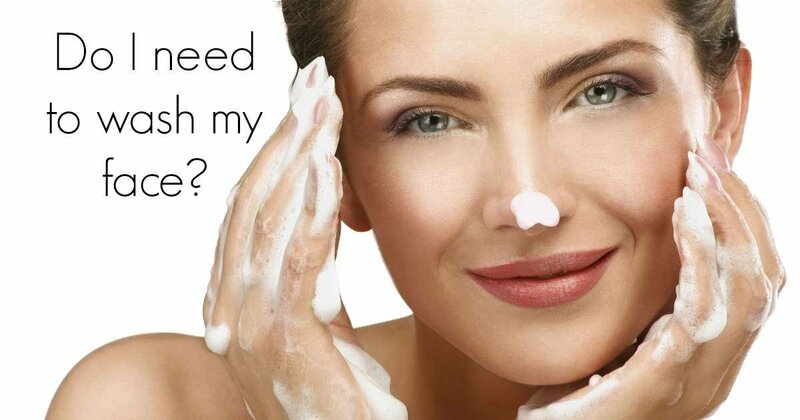 Do you wash your face? Learn why washing your face is important and get all of our best tips on how to do it in this Brown Barn Botanicals blog.